Sheer vintage glamour at its best! 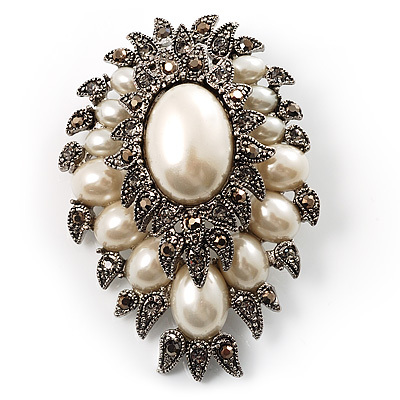 This divine large Vintage Corsage Faux Pearl Brooch has an air of 1940's Hollywood combined with dramatic Victorian influences. Bold in size yet subtle in colour, antique silver tone is adorned with shimmering dim grey crystals and ivory coloured faux pearls. It measures 75mm x 50mm and fastens with a flag pin and revolver clasp. This corsage brooch would also make an exquisite gift for Mother of the Bride as a eternal corsage of special memories and would look divine pinned on the shoulder or sash of a wedding gown.